Where are you living from? If you have many things to take on holiday, including your car, opt for sea travel solution. 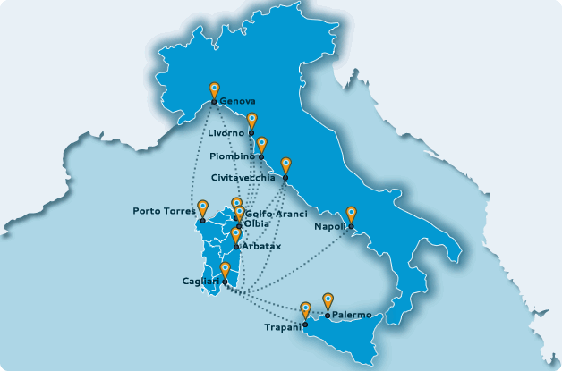 The ports of departure are Genova, Livorno, Piombino, Civitavecchia and Naples, and the arrival ports are Olbia, Golfo Aranci, Porto Torres, Arbatax and Cagliari. The trip is already a holiday. The comforts of modern ships allows you to face the crossing in an extremely pleasant way. You can live this experience at night, sleeping comfortably in your cabin, or you can savor it by day, burning within a few hours the distance and waiting. If you travel at night you board at dinner time and you're there before breakfast. The 8/10 crossing hours have lulled your sleep and you are ready to live your first day in Sardinia. If traveling by day on a fast ship you are dedicating the morning or afternoon to cross that piece of cargo of Mediterranean history that has been the crossroads of the most important viciltà of the past.